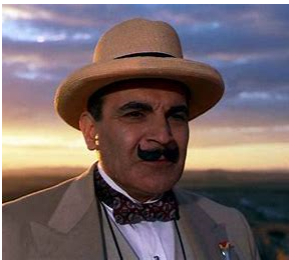 But I digress…Nobody EVAH writes about the wonderfully witty Ariadne Oliver character in Agatha Christie’s oeuvre, so I thought I’d just fill you all in on how I felt. I loved that character. 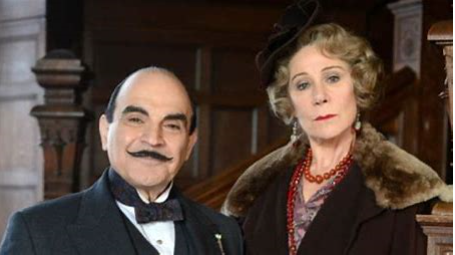 And Poirot and Miss Marple, too! 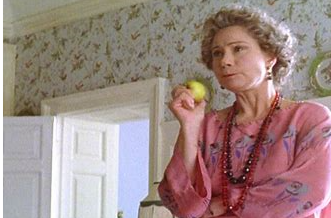 And we’ve never seen a picture of an apple-munching Dame Agatha. No. By no means is Laura Thompson’s meticulously researched and thoughtful book about dotty, apple-munching Ariadne Oliver. It is securely focused on the elusive Dame Agatha Christie herself. No one can explain how she was THAT prolific. She just seemed to never stop writing. And as she got older, she used to DICTATE her books into a Dictaphone. Writing mysteries was essential to her as breathing. And as seemingly effortless. Though as a single Mom after her divorce, she was forced to support herself. J. K. Rowling another prolific female British author, she, of the Harry Potter books comes to mind. Though Christie always had servants and was never on welfare as Rowling famously was. Laura Thompson was allowed access by the Christie family to many notebooks and papers that have never before seen the light of day. It’s a treat for Christie lovers, and a triumph of a biography for Thompson. I can’t imagine anything being more thorough. 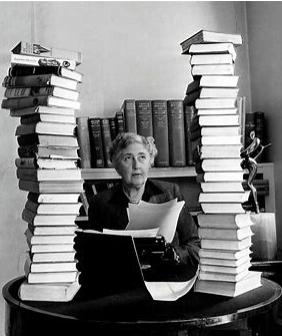 “Agatha Christie: A mysterious Life” is exhaustively complete. And thoroughly researched, with end notes and footnotes galore. Thompson interweaves episodes from the very secretive Christie’s life, as they appear, quite baldly in her prose. She never got over the break-up of her first marriage to the very handsome fighter pilot Archie Christie before WWI broke out. Needing a Crying Wall, Christie seems to have poured her heart out in her Mary Westmacott books. Under a pseudonym, she could tell the truth. But actually I find the Westmacott books inferior reads to her bounty of mysteries. She needed the focus of a murder. She had a mind like a serial killer. And she just couldn’t stop writing. All her books Thompson reveals, are one way or another thinly disguised re-tellings of her break-up with the dashing rogue, Archie. Thompson posits that he is the barely cloaked villain in many, many of the stories. And all the violence she felt towards him, she took out on the page. Much to the delight of millions of readers. Her difficult relationship with her only daughter Rosalind is gone into in great detail. Christie was an atrocious, absentee mother, and her daughter looked and sounded like her father. She didn’t take after her mother at all. Hard-headed, she became the businesswoman her flighty mother never was. And was in large part, the reluctant caretaker of her literary empire. But it is Thompson’s tendresse and insight that spell-binds. She especially excels by slipping into the first person as Agatha herself recounts her doings during her infamous ten-day disappearance, which ended her first marriage, even though she didn’t want it to. Hiding out under the guise of a “Mrs. 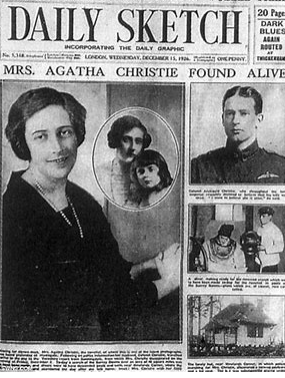 Neale” at a Harrowgate Spa in 1926, the entire U.K. was out searching for the lost, “poor Mrs. Christie,” sure that Archie had done her in. Thompson reveals a never-before mentioned letter that Agatha wrote to Archie’s brother Campbell, telling them all where she was, but the letter seems to have gone astray and caused the ten-day ruckus that made her famous and made every book she subsequently wrote a best-seller. It also ended her private life. Now forever a controversial public figure, by many who considered it a publicity stunt, Rosalind said “She ruined my father’s life.” The family all the while covered it as amnesia. And a fan looking for a new Poirot or a new Miss Marple (her other great detective, an old lady who knits, no less) are more than going to find them popping up like real life figures as Christie goes through her trials and tribulations. For in Thompson’s skilled tellings, they WERE like real figures to her. And to us, her devoted, beguiled readers. 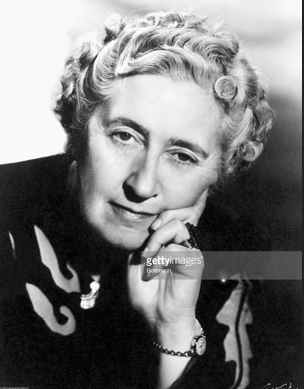 “Agatha Christie: A Mysterious Life” is a treasure to be bought and savored.